Read ... Rhyme ... Play ... Under the Sea images to color. 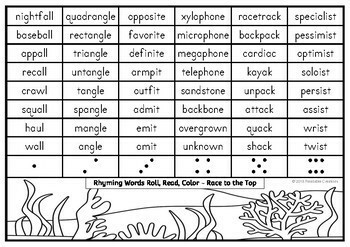 These Rhyming Words Roll, Read, Color sheets can be used during Guided Reading time as a teacher-directed or student-directed group/pair activity. Each student in turn rolls a dice and goes to the first uncolored space above the dot/s. (At the beginning, all the spaces are uncolored.) 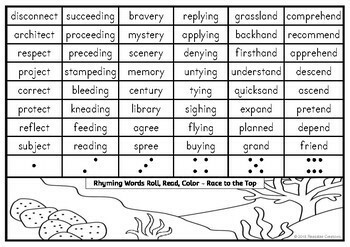 They read the word in that space *all the words in that column from bottom to top, then color that one rectangle. This process is repeated until all the rectangles in one column are colored. The first student to race to the top - color all the rectangles in one column from bottom to top - is the winner. *For differentiation, the higher-level readers can read every word in the appropriate column for each roll, but only color the next rectangle up the column. This will give them more exposure to the words. There is an ‘under the sea’ scene at the bottom of each sheet. Your students can color their scene at the end of the game. 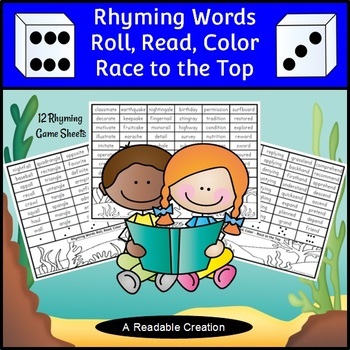 Most of the rhyming words in this pack are included in the ‘Rhyme Vocabulary in ABC Order’ pack. They complement each other.